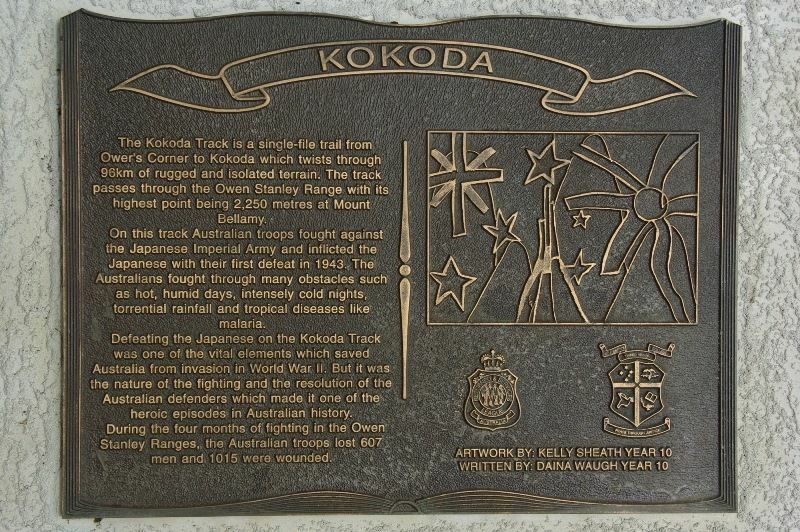 The plaque commemorates those who served on the Kokoda Track during World War Two. The Kokoda Track is a single-file trail from Owen's Corner to Kokoda which twists through 96km of rugged and isolated terrain. The track passes through the Owen Stanley Range with its highest point being 2,250 metres at Mount Bellamy. On this track Australian troops fought against the Japanese Imperial Army and inflicted the Japanese with their first defeat in 1943. The Australians fought through many obstacles such as hot, humid days, intensely cold nights, torrential rainfall and tropical diseases like malaria. Defeating the Japanese on the Kokoda Track was one of the vital elements which saved Australia from invasion in World War II. But it was the nature of the fighting and the resolution of the Australian defenders which made it one of the heroic episodes in Australian history. During the four months of fighting in the Owen Stanley Ranges, the Australian troops lost 607 men and 1015 were wounded.